At long last, the night he came home again is here. 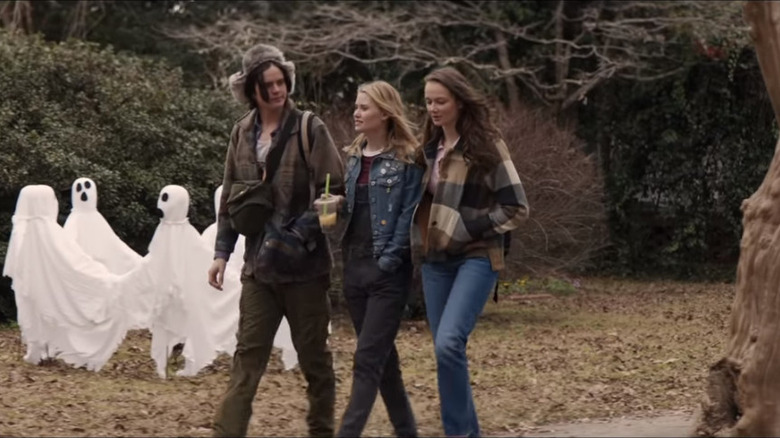 Director David Gordon Green's Halloween, a 40-years-later sequel to John Carpenter's original 1978 classic, is finally upon us, which means moviegoers everywhere can now take in its many scares, laughs, thrills, and mysteries. 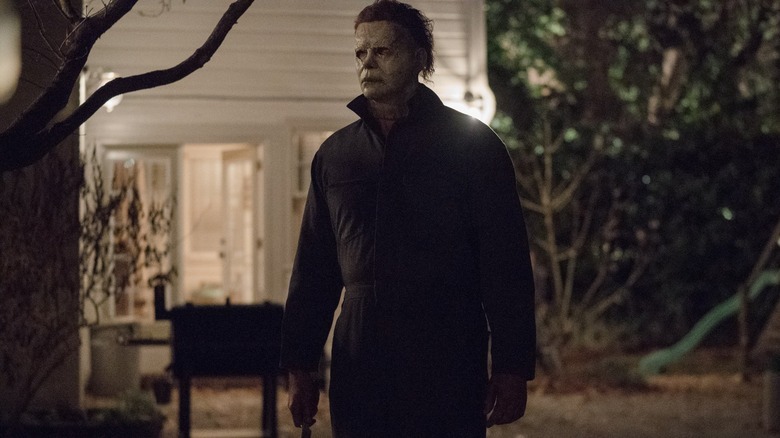 In some ways, the new Halloween film is — like its predecessor — blissfully simple, the story of a determined woman (Jamie Lee Curtis' Laurie Strode) taking on an unstoppable killing machine in the form of Michael Myers (Nick Castle and James Jude Courtney). Just like how the original film gave Michael's story with an almost supernatural eeriness, though, so too does this film go beyond the limits of a normal realistic slasher flick, imbuing its entire runtime with a certain degree of mystery, particularly its rather abrupt ending. Oh, and it should go without saying, but SPOILERS for the entire film are ahead. Though he's certainly the primary villain of the film, we learn by the end that Michael Myers isn't the only source of darkness in Halloween, because this time the doctor who's fascinated by him takes things to a truly dangerous level. Dr. Sartain (Haluk Bilginer) makes it clear very early on that he's not finished with Michael yet, and his commitment to riding the bus with him during his transfer is yet another sign of a perhaps unhealthy fixation. Things take a truly terrifying turn, though, when Sartain murders Sheriff Frank Hawkins (Will Patton) rather than letting Michael die. Sartain has become convinced that to truly understand Michael, he must allow Michael to see his final murder through. Sartain himself becomes Michael's victim shortly after trying to fulfill this quest, proving that he never truly had a connection with his patient. Even after his demise, though, questions about Sartain linger. Was Michael the only patient he enabled in this way? Did he have such fixations with other killers in other hospitals? And what about the bus crash? We never actually see how that happened. It's entirely possible that Sartain himself may have been behind it, freeing Michael to make his way to Haddonfield again. We may never know the true depths of his obsession, but there's still plenty left to explore. Halloween ends rather abruptly, with three generations of Strode women riding away from Laurie's burning house after having finally (seemingly, at least) killed Michael Myers. That means the audience doesn't get to see all of the cleanup, investigation, and processing that comes in the aftermath of Michael's killing spree, which counted Aaron (Jefferson Hall) and Dana (Rhian Rees) among its victims. When we left them, the pair had already done plenty of research and even interviews on the Myers case, only to end up victims of Myers himself. We don't get to see how the world reacts to this, but if you follow true crime podcasting at all, it's pretty easy to guess that someone out there would launch a podcast about Aaron and Dana and their quest to understand Michael. It would be like Serial, only far more violent and even perhaps unfolding in real time as new evidence in the case came to light. Aaron and Dana's presence in the film is itself a commentary on how we view true crime and serial killers now, so imagine how metafictional things could get if they themselves became subject to the same level of fascination. 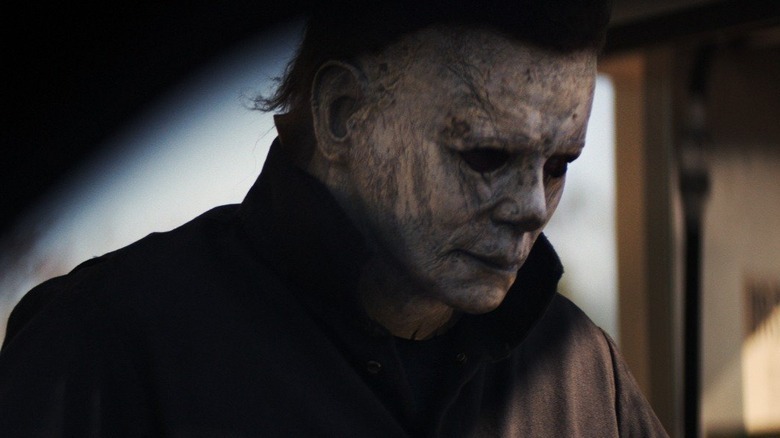 One of the most effective shots in Halloween comes in the chilling pre-credits sequence, when Aaron and Dana visit Michael at the mental institution, and Aaron reveals that he's brought along a little souvenir from the district attorney's office: Michael's original mask, a little worse for wear after all these years but still very much intact. Michael didn't forget that Aaron had that little memento, and one of the first things he did upon escaping was track the two podcasters down, murder them, and steal the mask from the trunk of their car. As we see in the lead-up to that moment, though, the mask isn't the only thing the pair seemed to get from the district attorney. There's a whole file box packed with Michael Myers evidence, including photos, files, and other paraphernalia. So, what happened to it? We can't say for sure. Maybe Michael took it, maybe the police got it back, or maybe it's still sitting in that trunk somewhere. Whatever the case, if it falls into the wrong hands, there's either going to be a psychopath out there who becomes inspired or a creepy collector about to get rich off a few eBay sales. Whatever the case, that evidence means the cult of Michael Myers obsessives could grow even in his absence. 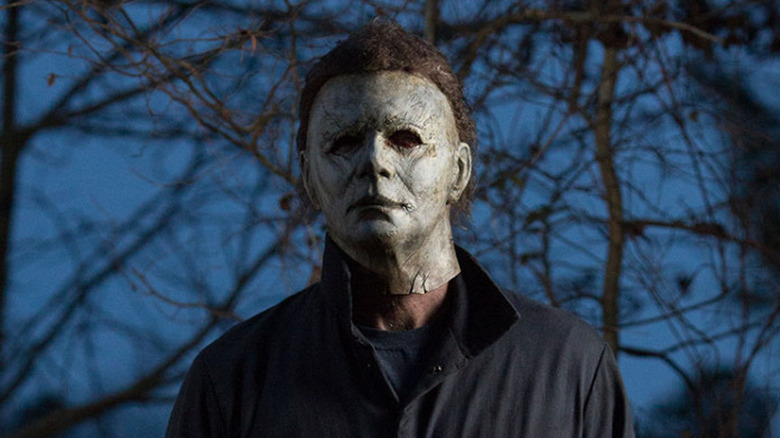 What exactly is Michael Myers? Aaron and Dana insist that he's human, even if he is a murderer, while Laurie carries on Doctor Loomis' belief from the original film that Michael is simply evil personified, a killing machine with no compassion or care other than an unstoppable desire to hurt other humans. That certainly strips some of the emotion away from the character, but what about his physical state? 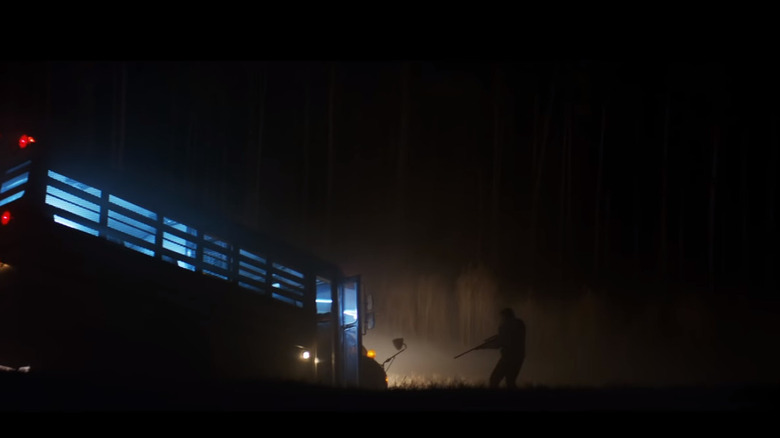 We know from context clues that he can be harmed, because he still bears a scar on his eye from where Laurie stabbed him with a coat hanger, and we see Laurie blast away some of his fingers in the final fight. He never seems to react to pain in any audible way, though, and he never seems to stop even after significant injury and blood loss. Plus, he's able to not only kick out the barrier separating the front and back seats of a police car, but stomp his doctor's face so hard that his skull shatters in an instant. All of this, plus his sheer relentlessness, adds to the mystique of Michael Myers, and suggests that even if he can be harmed, he might not necessarily be working with the same mortal limitations the rest of us are. After 40 years of essentially doing nothing in prison, he's still that strong and that determined. It makes you wonder what else he might be capable of…and if one of his capabilities might be cheating death. All high schools go through some form of tragedy and loss, but Haddonfield High School has had more than its fair share of terrifying things to deal with. First, in 1963, the students had to grapple with the death of Judith Myers. Then in 1978, when her classmates were adults living in Haddonfield, they all had to deal with the Babysitter Murders, which took the lives of three different teenagers in one night. Now, in 2018, there are at least three other teenagers dead thanks to Michael Myers, and yet another Strode girl left to deal with the after effects of the violence. Again, because the film ends so abruptly, we don't actually get to see what happens to Haddonfield High School and its students, but they're going to returning to class with three of their friends dead and another one in need of some serious psychiatric care, not to mention a whole host of students left to deal with major grief issues. It's not just one horror. 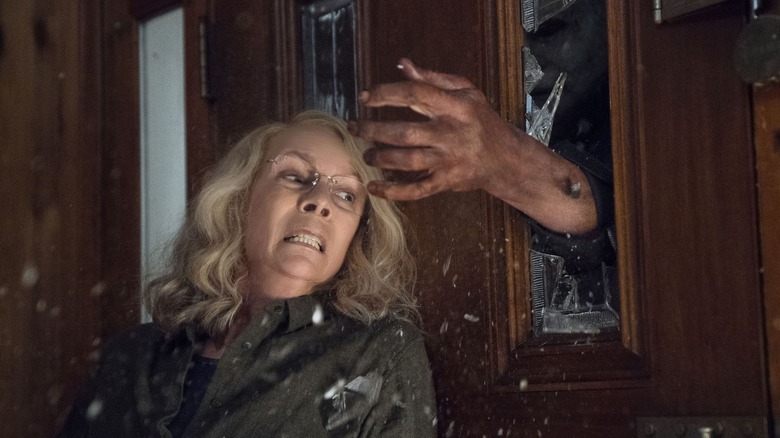 It's a historical pattern of horror visited upon teenagers in this town, and while we often don't think of that in slasher films, the presence of Laurie Strode's PTSD throughout Halloween underlines that these teenagers will really require some care and empathy after this latest horrific holiday. 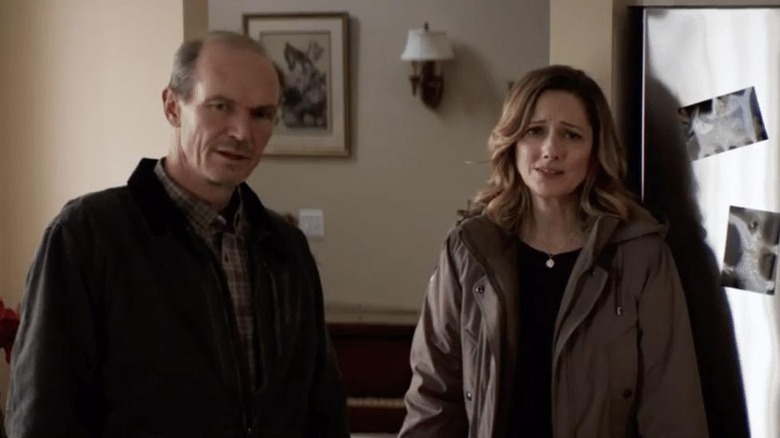 Karen Strode (Judy Greer) spends much of Halloween outwardly fearful of and hostile toward her mother, who she blames for the more dysfunctional parts of her brain that tell her to be constantly paranoid and on edge. Karen even goes so far as to insist to her mother that she's making a deliberate choice to reject her teachings, telling Laurie that the world is largely full of good people. Then, in an instant, with her back against the wall, Karen Strode remembers what her mother taught her, luring Michael Myers into the basement stairway just long enough to get off a wounding shot and begin the process of trapping the monster once and for all. It's a cathartic moment not just because it proves that Laurie was right to be prepared all along, but also because it allows Karen to turn all that fear and distraction she's been grappling with her whole life into a moment of genuine power. Laurie carries most of the burden of the confrontation with Michael, but all three Strode women change in the process, and Karen's change might end up being the most powerful if she can learn the right lessons from it. What price did Allyson pay? Karen Strode is all too happy to talk about the damage her mother's post-traumatic stress disorder had on her. We hear throughout the film about how she was raised, how Social Services came and took her away, how she was forced to learn marksmanship and self-defense, and how she won't let that happen to her own daughter. 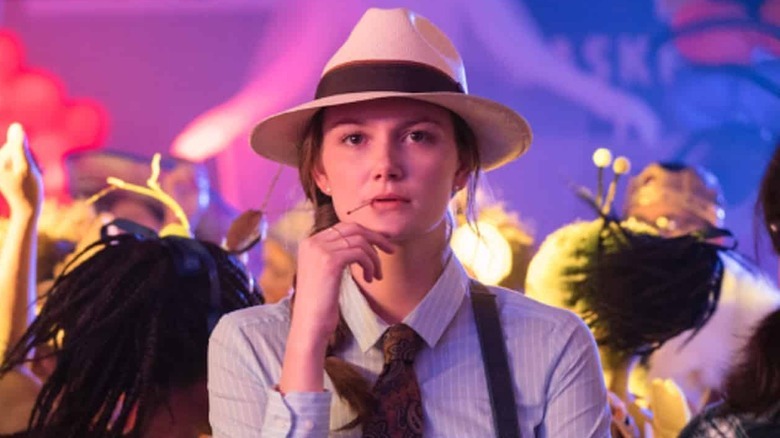 For her own part, Allyson Strode (Andi Matichak) seems to do everything she can to connect with and empathize with her grandmother, and by the end of the film she might be able to empathize a bit too much. In the final moments of the movie, we see that Allyson has not yet let go of Michael's knife, which she just moments earlier used as a key weapon in part of a fight to systematically trap and murder him. The way the knife is hanging limp and bloody in her hand seems like a very clear visual reference to the way in which young Michael held his first knife after his own first murder back in 1963, when he was just a boy. Is Allyson simply shell-shocked from the violence, or is something deeper and darker at work here? Perhaps we'll find out one day. Both the original 1978 film and the new sequel spend a lot of time building up the legend of Michael Myers. They call him The Boogeyman. They brand him purely and simply evil. Laurie herself calls him "The Shape" in this film, echoing the iconic moniker he was given in the first movie's credits. Through all of this, Michael becomes larger than life, and in the end it takes a massive coordinated effort to finally bring him down. But the Strode women are seemingly successful in completing Laurie's 40-year mission to end the evil that's plagued her for her entire adult life. That means that, by the end of this film, Laurie Strode herself has somehow become a legend, building on the reputation she's built as the paranoid old woman who lives out in the woods to transform into something more. She's no longer the delusional trauma victim, or the struggling alcoholic, or the doomsday prepper. She's the Woman Who Killed The Boogeyman. We don't get to see any of the aftermath of that play out in this film, but it's a powerful narrative, and any number of journalists and other public figures are bound to take an interest in telling her story and perhaps setting Laurie on the road to true recovery. Now it's time to discuss what will undoubtedly be the most-debated, most important element of Halloween's ending: Whether or not Michael Myers is actually dead. Because this film ignores all previous sequels, we go into it with no real hint that Michael is anything but a sadistic killer who just can't stop himself from murdering people. His mental state is one of evil, but physically he's just a guy, right? Well, that's a question a potential sequel might need to explore, because while it's clear that Laurie, Karen, and Allyson are able to trap Michael in the basement and then light the whole house on fire, it isn't clear if that actually kills Michael. Yes, there are a few precious moments in which he's surrounded by flames, but the last thing we see happen at Laurie's place is the fire beginning to engulf the exterior of the house. We do get one shot of the basement as the house burns…and he's not there. We don't ever see a body, which leaves plenty of wiggle room for Michael to escape, whether through supernatural means or just finding a gap in the floorboards (remember, Laurie shot through them at one point) to wriggle out of just in time. And of course, viewers who stayed through the credits got to hear some creepy, ominous breathing. Sure seems like a heavy hint that Michael indeed found a way to survive. We'll see if Halloween 2 is in our future.